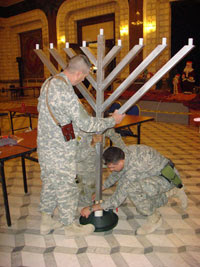 Soldiers deployed in Iraq celebrate the eighth night of Chanukah 2007 in Saddam Hussein's Palace. 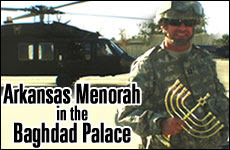 Celebrating Chanukah 2007 in Saddam Hussein's Republican Palace, who would think? Yet tonight inside a marble encrusted hall in Baghdad, we lit the eighth light of a hand-made, 6-foot tall menorah. We prayed in Hebrew, joyfully sang a medley of Chanukah songs, ate latkes, and best of all, we were Jews together in the land of our earliest forefathers. The Jewish community at the US Embassy in Baghdad is growing and thriving to such an extent that we now reliably form a minyan. We call ourselves B'nai Baghdad -- a diverse group of US and Coalition uniformed service members and civilians stationed in the International Zone (IZ), known colloquially as the "green zone," an enclave in central Baghdad that houses Iraqi government officials, various embassies, military headquarters, and international aid organizations.